Allegiant Air is flying into the hotel business. The Las Vegas budget carrier has announced plans to build a beachfront resort with a hotel, nine condominium towers and a marina spanning 22 acres in western Florida. Construction is expected to start by mid-2018 on the Sunseeker Resort, creating a new revenue stream for Allegiant under the guidance of John Redmond, a former Las Vegas hotel executive who now works as the air carrier’s president. “This is an amazing opportunity for us because our airline caters to nothing but leisure customers,” said Redmond, a previous CEO at MGM Grand Resorts who also served on the board of the Tropicana Las Vegas and held senior executive positions at Caesars World Inc. 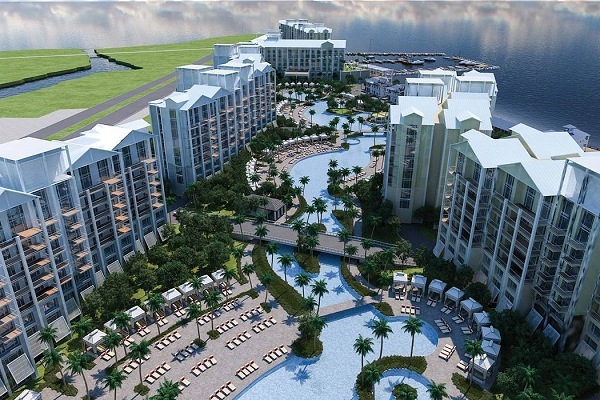 The resort is set to open by early 2020 and will cost up to $600 million to build in Port Charlotte, a small town near the Gulf of Mexico. Conceptual drawings illustrate a 1,000-foot-long pool, 1,100 condo units and a hotel with 75 to 100 rooms. The hotel-condo complex site is less than six miles from Punta Gorda Airport, where Allegiant is the sole carrier and is projected to serve about 1 million passengers this year. More than half of Allegiant’s planes and passengers fly to Florida as a destination. Domestic airlines owning a hotel has been a trend of late. Virgin America opened its first boutique-style hotel in Chicago two years ago, with plans for additional locations in New York and Nashville. The shuttered TWA airline terminal at New York’s John F. Kennedy International Airport is being converted into a hotel under a partnership between JetBlue and the Port Authority of New York and New Jersey.